After a few forays into the stock market (such as betting on oil in 2014) and reading thousands of pages on investing, behavioral finance, and even getting a bachelor’s degree in economics, I have come to the inescapable conclusion that I am not a genius stock picker. I do not have the time, energy, or desire to find the next Apple, Google, or Tesla. Rather than trying to find the needle in the haystack, I just buy the entire haystack. Passively managed index funds consistently beat their actively managed cousins. This fact is proven every time a study is conducted. Just Google “passive funds vs. active funds” and you will see a news article every year going back at least 25 years. The fees active managers charge just don’t make up for their lack of performance. While 10-20% of actively managed funds do beat their benchmark index, good luck finding that particular fund before it starts beating the market. Past performance is not a guarantee of future results. Rather than focusing on finding higher return (and therefore riskier) investments, something that is outside of my “locus of control,” I choose to focus on my personal savings rate. When it comes to reaching financial independence rapidly, the data shows a high savings rate is the most important factor. Here’s one study from Vanguard and another from Go Curry Cracker. My wife and I keep our costs low by only owning one car (a fuel efficient 2015 Mazda 3), renting an apartment $1000 less than our BAH, and cooking most of our meals at home. By making conscious lifestyle choices and minimizing our big three expenses (housing, transportation, and food), we can relax about our other spending (entertainment and travel). Since we automate our investments, we find it’s actually very easy to invest 50% of my income and 90-100% of hers. It’s all about creating a sustainable lifestyle that you enjoy. This year we are on track to max out our Traditional IRAs and Traditional TSP contributions by August. Rather than dollar cost averaging through the year, I decided to front load our contributions and try to max out our retirement accounts as fast as possible. This decision is partially based on the research done on the Mad Fientist blog, whereby front loading your tax-advantaged accounts in the beginning of the year you can cut months or years off of your journey to financial independence. 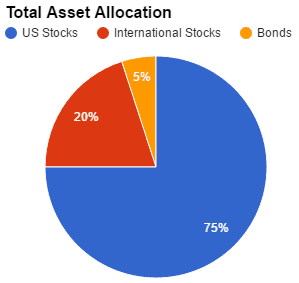 My 2016 asset allocation is 95% stocks, 5% bonds. 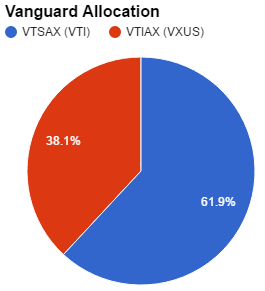 Within that overall asset allocation, I hold 75% of my investments in US stocks through in the Vanguard VTSAX (VTI) Fund, TSP C Fund, and S Fund. Since the C + S Fund = VTSAX, I hold 4x as much C Fund as the S Fund because the C Fund's market capitalization is 4x as large as the S Fund. International stocks make up 20% of my portfolio, all held in the VTIAX (VXUS) Fund. I’ve moved away from the TSP I Fund due to it not completely representing the total international stock market. My bonds are held 2.5% in government bonds through the G Fund and 2.5% through the F Fund. Since about half my investments are at Vanguard and half in the TSP, I had to split the percentages. I also don’t hold bonds in my Vanguard accounts and no longer hold international stocks in my TSP due to the deficiencies of the I Fund. I still invest at Betterment but it does not yet represent enough of my portfolio to include. Here’s our total average expense ratio (0.07%) across all of our funds, as shown by Personal Capital. 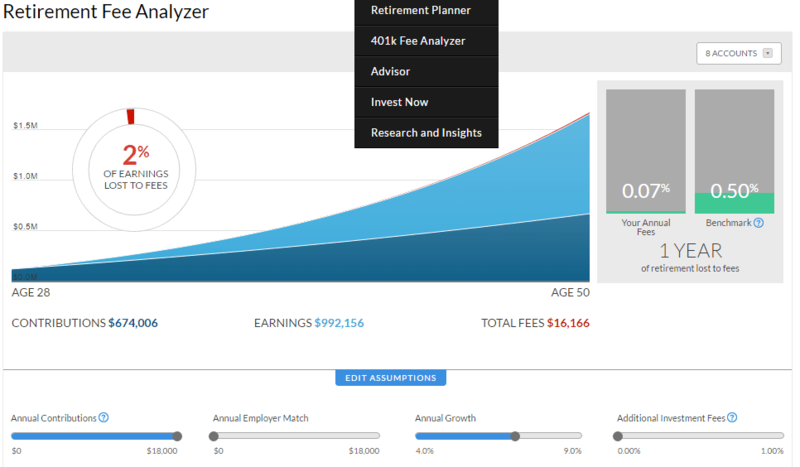 You can get your own average expense ratio by running the fee analyzer at Personal Capital for free. Because I still have some Vanguard Investor class shares and not Admiral class, the expense ratio is a bit higher than it probably will be in the next year as I upgrade to Admiral funds. With an average expense ratio of 0.07%, I own some of every publicly traded US stock (4000+), 6000+ international stocks in 47 countries from New Zealand to Pakistan, and a good mixture of US and corporate bonds. At 0.07%, every $100,000 invested only costs me $70 per year. That means more of my returns stay with me, rather than going to the fund manager. This is the kind of low cost investing you get when you stick with the TSP and Vanguard. I love it! The Thrift Savings Plan is the best tool for servicemembers to automatically invest every month. Setup a contribution on myPay, then go to the TSP website to adjust your asset allocation. You can rebalance daily but there’s really no need to. I rebalance once a year on May 1. Why 1 May? There’s an old adage in investing circles to “sell in May and go away,” meaning don’t leave your investments in the market May-October. Like all adages, there is a grain of truth to it, but really it’s hard to implement correctly. Better to stick with your asset allocation throughout the year and only check on your investments every few months. Remember that it’s time in the market that makes you the most money, not timing the market. So I don’t “sell in May” but I do rebalance in May. Some people rebalance in December, some in January, some on their birthday, some on their anniversary. It doesn't really matter. Just pick a date and stick with it for a few years. Again, the TSP makes rebalancing incredibly easy. Just go to the Interfund Transfer option and set your percentages to whatever asset allocation you have chosen. Vanguard has a great “maximize retirement contributions” feature that will withdraw money from your checking account to ensure that you end the year with maximum contributions. Because I am front loading all my contributions, I’ve just set up an automatic transfer into our Traditional IRAs so we max out the contribution before August. How are you investing in 2016? So that’s me, but what about you? Let me know in the comments or contact me page. What are your core investment principles? Do you like to actively manage your portfolio or do you just try to match the market? Do you think a 95% equities portfolio is too risky or am I missing out by not having enough bonds? ← Leaving the military? Negotiate that salary! I prefer the Roth TSP over the Traditional TSP because even though I’m paying relatively low taxes now (15% effective rate), I’m only paying taxes on the contribution portion. The gains that I hope to realize over a 30+ year period will most likely outpace my contributions due to compounding. With a Roth TSP, I won’t pay any taxes on those gains like I would if I had a Traditional TSP account. I do have a big chunk of funds in the Traditional because the Roth was not available when I started but I strictly stick to the Roth TSP and max it out every year. Because I’m currently deployed and I’ve already maxed out the Roth for year, I’m thinking about contributing a little bit to the Traditional TSP to take advantage of more tax-free savings. We’re at turning point in the market cycle (bull market is topped) and passive investing in large cap/small equity is not smartest thing you can be doing with your money right now… it has worked great the past 7 years though. If you’re in TSP, it makes sense to do an interfund transfer to Fixed Income (Bonds are being bought up because of the “flight to safety” mentality + yields are flat). In the interim, wait for equities to come down, then go back in. Otherwise you’re just going to give back all your gains from the past few years in the coming years. I’m not a believer that I can time the markets. I have my asset allocation and I’ll stick to it. Try reading “A Random Walk Down Wall Street” or reading the Bogleheads post on market timing. Good video at the bottom too. Let me know how your strategy works out over the next ten years vs. buy and hold. YTD, F Fund is outperforming C and S and will continue to as long as the Fed keeps rates flat and global markets can’t find their legs… Check it out, calculate the returns yourself. I’m 80% in F fund with 4% returns YTD. Chasing performance is a great way to get no performance. Let me know how this strategy works out for you over the year. That makes sense with the Traditional IRA over the Roth IRA. I got into the habit of fully funding my Roth IRAs while I was on active duty. My income wasn’t high (E-5) and I frequently deployed, so taxes weren’t too big of an issue for me. I also love the ability to pay taxes now, and never have to worry about them again. That, and there are no Required Minimum Distributions with the Roth IRAs as there are with Traditional IRAs, 401ks, TSP, etc. So there is long term flexibility with the Roth IRA. The easiest way to transfer your Roth IRA from USAA to Vanguard is to start the process online with Vanguard. They will walk you through what paperwork you need to provide and take care of the account transfer online for you. Hey, Spencer. Awesome blog you have going here. I check for new posts every day. Air Force 2d Lt here just trying to follow in your footsteps. I started investing in single stocks in 2014 and have since acquired shares in 12 large cap stocks. However, I started to wise up at the end of last year and opened a Vanguard account. I also started contributing to the Roth TSP around the same time. I allocate 95% to stocks (75 in C, 10 in S, 10 in I) and 5% to bonds (all F Fund). Two months ago, I increased my monthly TSP contribution to 30% of base pay. Not quite able to max out Roth TSP for the year, but should be able to do so in the near future. If I am able to invest more of my discretionary income, I will throw it all into my Vanguard account, which is the VOO. No transaction fees and very low expense ratios are very enticing! Thanks again for your posts. I really enjoy reading them. Take care! 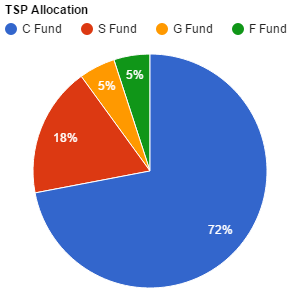 Why no G Fund in the TSP? It’s an excellent government bond investment that should provide capital preservation and inflation protection. Might want to look at adding it to your portfolio. Otherwise, very nicely done for an LT! What were the 12 lucky large-cap stocks? Before I decided on my contribution allocation, I evaluated my goals, investment timeline, and risk level. It turned out that I am not very risk averse and being relatively young, my time horizon is pretty far down the road. I am ok with the idea of taking losses if it affords me the opportunity to at least double the risk-free rate of return over multiple years. However, maybe I should consider the G Fund with the rate of inflation being as low as it currently is. My lucky 12 are DAL, UNP, AAPL, AMZN, WMT, JNJ, MPC, DOW, EMR, VZ, DUK. I’m not unhappy with these holdings considering the diversification across multiple sectors. However, the transaction fees that result from frequent and relatively small amounts of money invested into all of these stocks definitely start to cut into overall profit. That’s why I decided to switch to a dollar cost averaging strategy with my vanguard ETF. Spencer, have you ever tried or thought about investing in single stocks? I have tried my hand at investing in single stocks but after reading “The Intelligent Investor” I am more convinced than ever that it is a losers game. I do not have the net worth at this moment to try investing in individual companies. Instead, I’m happy to continue to save and invest thousands each month into low cost index funds in the TSP and Vanguard. I know that over the long run (20+ years) I’ll see a better return than any other strategy and I sleep much better knowing that. The Intelligent Investor – that’s a great book. I’m just about finished with it. Any other books that you recommend? A Random Walk Down Wall Street is up next on my list. I love the overall concept of your portfolio. I’m in the process of simplifying mine, using similar philosophies. My current overall fees are around 0.20%, but I’m working on reducing those further. I should be able to get it down to the 0.10% – 0.15% range in the near future. My TSP holdings are very small, because I converted them to an IRA after leaving the military (which was the right move based on the tax-exempt contributions I was able to roll into a Roth IRA – these were from before the Roth TSP was available). My bond allocation is slightly higher, but I won’t have an immediate pension starting around age 40, which factors into that decision. I hope to have a Guard pension starting at age 60, but I’m still 11 Good Years away from being eligible for retirement, and 24 years away from being eligible to receive retirement pay. So I don’t want to account for that in my portfolio at this time. I also find it interesting that you don’t invest in a Roth IRA. I understand some super-savers and some folks in the FIRE community prefer Traditional IRAs because they feel they will later be able to retire, then transfer to a Roth IRA when their income is lower. But that strategy won’t work for everyone. Your military retirement pay may make that strategy difficult to pull off as well. I decided to invest with a Roth so I can hedge my bets and have that added tax flexibility when I reach retirement age. If I can rollover some of my Traditional accounts to Roth accounts, then so much the better. But I’m not counting on being able to do so. For the Traditional vs. Roth debate it comes down to this: if I’m paying any taxes now (ie, NOT CZTE pay), then I probably need to contribute to my Traditional accounts to get my tax rate lower. We owed $2000 on our taxes in 2015 because my withholding was a bit low and we had some additional income. However, I re-characterized the contributions from our Roth IRAs to our Traditional IRAs and our tax bill became a $200 refund. Rather than giving the government $2000 that I will never see again, I can invest that money for 40+ years in my Traditional IRAs and let it grow. If I have no taxes or an extremely low tax rate (ie, 6-9+ months of tax free, CZTE pay), then I’m definitely going to try to get that untaxed income into my Roth accounts (TSP and IRA) because it will withdraw untaxed after it grows untaxed for 40+ years. Also the Roth IRA conversion is definitely a strategy that I plan to pursue when and if my income drops after becoming financially independent.